Spice up your crockery corner with our ten best professional chef knives for this culinary season! Restocking on our professional chef knives will not only aid you in your everyday cooking tasks what with exiting new features and the promise of quality but will also be a joy for you in the kitchen! Cooking requires proper tools, like all arts, and we are here to make the selection process easier for you with a complete review of the best-rated chef knives. Follow the review below and look out for your preference when it comes to quality, sharpness and aesthetic in best professional chef knives. This eight inch knife with a sleek, dimpled, 2,5mm blade is ideal for slicing through sticky and juicy food products like summer squash, potatoes etc. It comes with a beautiful, Pakka wood handle that is not only aesthetically pleasing but also allows you to hold the knife for long time periods without causing numbness or pain. 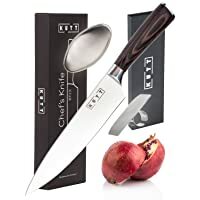 The knife is extremely light-weight which makes it a must-have in the kitchen for all purposes, whether you are an amateur or professional chef. Made with steel and available in a lovely, silver color, the blade has several dimples which prevent food products from sticking to the blade. This professional chef knife comes with a big advantage of being extremely lightweight which not only makes everyday cooking tasks easy but also makes sure that your hands do not bear the brunt of the task. The dimensions of this product are 8 x 1 x 1 inches. The weight of this product is 1.5 pounds. Made in Japan from steel. Thin bolster and thin blade. Should be washed by hand only. Retains a sharp edge for a long period of time. Sharpens easily on a whetstone. Ink on the blade may wear off. Is not resistant to rust. This beautiful and efficient knife sets a high standard for other knives within the same category with its full tang, sharp blade and rounded handle that makes sure you have full grip on the knife as you slice through food. Even better, this knife comes with a limited warranty if any manufacturing defect is found. It comes in an aesthetically pleasing packaging which makes it ideal to be gifted to you loved ones. The blade is made of imported Japanese steel (AUS-10) with 67 layers of stainless steel with a high carbon content. 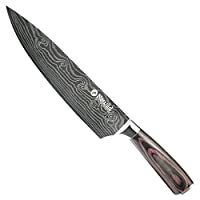 Not only is the blade sharp but it also has non-stick properties and a visually pleasing pattern of Japanese Tsunami Rose Damascus. Since the eight inch blade has been tempered with liquid nitrogen, it remains free of rust and stain and, also retains its sharpness. Not only is the design of the handle simply beautiful with three rivets and a rounded edge, but the full tang, durability and the mosaic design all contribute to the beauty of the knife. The build of the handle and the tapered bolster ensure that it’s easy to hold and afford every possible comfort to the chef. The dimensions of this product are 12.9 x 0.9 x 1.8 inches. The weight of this product is 8 ounces. Resistant to stain and rust. Retains edge due to Rockwell Hardness 61. Triple-riveted with a rounded handle. High-quality steel that retains its sharpness for a long time. The packaging is elegant which makes it ideal for gifting to loved ones. Patterns from Japanese culture are found over the blade and the handle which makes it aesthetically pleasing to have in the kitchen. Some users found it difficult to see the patterns on the blade. Some users found that the knife dulled very quickly. 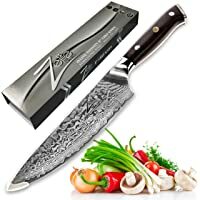 This best professional chef knife is the ultimate gift for all professionals with its innovative use of technology brilliant craftsmanship and beautiful design. The sharpness of the blade can be seen with its 62+ Rockwell Hardness and the 66 layers of stainless steel with high carbon content. In addition to its multilateral merits, the knife comes with a money back guarantee which ensures that you can experience the beauty of this knife yourself. The scalpel like edge is mirror polished by hand with the traditional Japanese, Honbakzuke method. In addition to this, the knife is nitrogen cooled and made corrosion resistant to give you the ultimate culinary experience. To maintain the sharp edge of the knife, the chef knife is made from ultra sharp AUS Japanese steel that is heat treated and balanced. The handle of the knife is not only hand-polished but constructed to make sure that you are allowed to control it with maximum agility and precision. The blade is 55m wide and makes sure you do not hurt your knuckles while using the knife. Cryogenic tempering makes sure that the steel is hard, strong, flexible and perfect. Handle is engraved with copper mosaic. Handle does not slip from grip. The weight of this product is 0.6lbs. The dimensions of this knife are 16.9 x 4.4 x 0.9 inches. Insanely sharp and cutting as compared to other knives. Beautiful and useful in its build and use. Some users found the knife heavy in the handle and a little unbalanced. 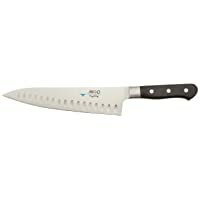 This knife is a compulsory purchase for all chefs due to its versatility and precision! Not only does this knife promise you durability, a multitude of purposes like chopping, dicing, slicing etc and an ergonomic handle but also promises lifetime guarantee. This knife is designed in Germany and contains about 0.6-0.75% carbon which ensures twice as much as sharpness as other knives. The blade is resistant to rust, stain and moisture. Tapered edge ensures that you do not have to exert extra pressure while cutting through everyday food products. The handle is ergonomic in its build and has been specially designed to makes sure that you feel no discomfort while using the knife. 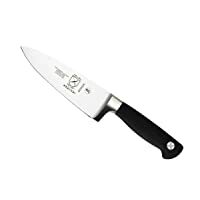 Its V-edged handle also helps with the cutting and slicing and is made from Micarta, which is much better than plastic or wood. Rivets on the handle give the knife a solid and stylish, sleek look and prevent it from breaking. The length of the blade is 7.5 inches. The weight of this knife is 14.4 ounces. The dimensions of this product are 14.6 x 3.3 x 1.3 inches. Beautiful packaging makes it an ideal gift. The blade usually does not retain its sharpness after a few instances of use. 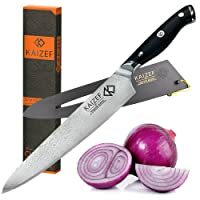 One of the best professional chef knives, the Kaizef model promises you elegance and aesthetic along with efficiency. It comes with a lifetime warranty which just shows the value that the company places in customer service. Triple-riveted blade and full tang lend the blade ultimate sharpness and make sure that you do not have to frequently sharpen the knife every few weeks. With a Rockwell Hardness of 62+ and made from stainless steel, this knife is the epitome of grace and precision. The knife is sharpened using the traditional Honbazuke method and is sharpened to 8-12 degrees to guarantee superior performance. The handle is properly contoured and tapered to ensure that you do not experience frequent slips while using the knife. The build is balanced and the hand-polished handle with an engraved Japanese Yamato Wave Damascus Pattern gives the knife a finished, graceful look. The package includes a knife sheath, a polishing fabric and a user’s guide. The dimensions of this product are 17 x 3.8 x 1.7 inches. The weight of the knife is 1.35 pounds. Some users were not satisfied with the sharpness of the blade. Designed in Switzerland ever since 1884, this product comes with a promise of long-standing quality and maximum comfort. 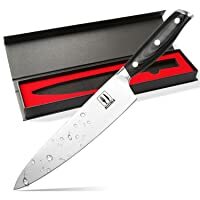 The knife is designed to fulfill a variety of purposes in the kitchen including mincing, dicing, slicing, cutting etc and is a beautiful addition to your collection of best professional chef knives. Lifetime warranty and quick customer service are also key merits of this product which everyone should consider before making a purchase. The blade is made from stainless steel and has a long, curve-like shape combined with a flat spine that helps reduce fatigue and pressure exerted by your hand and gives a superb performance while cutting. The ergonomic build of the handle reduces numbness and makes sure that the grip remains secure even if the knife’s handle is wet and greasy by using a textured design. Dishwasher safe although hand-washing is recommended. Weight of the knife is 0.5lbs. The dimensions of this knife are 18.9 x 2.6 x 2 inches. Plastic sheath included in packaging. Might require more pressure on the grip than anticipated. With its vast range of features when it comes to best professional chef’s knives, Mercer’s product provides maximum comfort and expertise to the hand of both professional and amateur cooks. Not only is the knife made with high-carbon, stainless German steel which prevents it from all forms of corrosion, rust and stain but also comes with a limited lifetime warranty if any manufacturing defects are found. The handle is made from Santoprene which makes sure that your grip does not slip while using the knife even if your hands are wet. The build and material with which the handle is designed aims to protect it from any adverse factors like kitchen oils and temperature. Balanced perfectly and combined with a bolster which strengthens the quality of the knife by making it more durable make it perfect for everyday use. The blade of the knife is made from high-carbon, stainless steel which makes it impervious to rust, stain and corrosion The blade does not discolor even after extensive use and has been tang and tapered to add balance and stability to the knife. The weight of this knife is 8.8 ounces. The dimensions of this product are 2 x 1 x 11 inches. Is resistant to damage by temperature or rust. A bit too heavy for some professionals. Edge might chip away with frequent use. 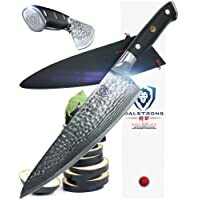 One of the best professional chef knives that you can possess, this particular knife allows you to slice through anything without any added pressure and has been approved by the FDA, combining both safety and quality in one product. The sharp, precise blades of this knife allow you to cut flawlessly through any product and cook any cuisine. Versatility is key for this product as it is made from stainless steel, chrome and carbon which makes it resistant to rust and makes sure that you do not have to sharpen it often. Comes with odor removing soap. The dimensions of this product are 15.8 x 5.4 x 1.7 inches. The weight of this product is 1.45lbs. Does not require frequent sharpening. Becomes less resistant to rust and stain over time. This knife is specifically designed for those who know a good quality knife from an average knife what with its beauty and quality. The knife is suitable for cutting most food products and is extremely versatile in its everyday use. The waved pattern on the blade made from stainless steel adds to the authenticity of the knife. Not only is this aesthetically pleasing but the blade is extremely harp, resistant to adverse factors, does not let product stick to the blade and is resistant to both corrosion and bacteria. The blade is 025mm thick and has a Rockwell Hardness of 55-58. The knife is so lightweight it only weighs 6.7 ounces and has a handle made of pakka wood. This ensures that you do not experience wrist fatigue during use and can easily maneuver it. The blade is made from molybdenum vanadium steel. Should be hand-washed and dried immediately after use to prolong the life of this knife. Extremely sharp and resistant to dullness. Extremely inexpensive for its high quality. Well-balanced with an impressive heft. The blade is not made from real Damascus. Cannot hold its edge for long. This knife is a must-have for all, ranging from amateurs to professionals as it is made to be versatile in its use; whether you use it for slicing, cutting, shopping, dicing or even for removing fleshy products off hard bones, this knife is your best friend. It contains all that you might need in a good professional knife and has both an extremely sharp blade and an ergonomic handle that contribute to its efficiency. 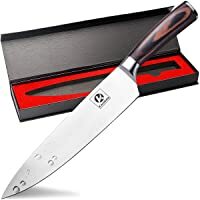 This knife has a Rockwell Hardness of between 58-60 which not only makes it sharp and sturdy but also helps you use it in any manner you desire. The tapered edge is built to make your experience precise and to make sure that the blade retains its sharpness for a long time. The blade is made from stainless steel which consists of 0.6-0.7% carbon which makes sure that this knife is twice as sharp as others in its league. To add to the beauty of this knife specimen, the handle is made from Pakka wood and constructed in a way that prevents you from experiencing any pain while you use this in the kitchen. Eight inch stainless steel blade. The dimensions of this product are 13 x 1.8 x 0.1 inches. The weight of this product is 8.5 ounces. The weight is ideal for professionals. Comes in a beautiful and elegant case. 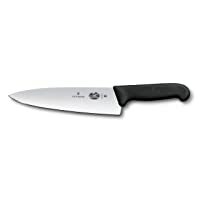 Sharper than other best professional chef knives. Knife is sharp when it arrives but might need to re-sharpen quite often. Some users felt that the knife possesses no heft at all.